Brice Feillu, the young French rider in his first year as a professional, won the Pyrenean stage at Arcalis in Andorra, when he outwitted the remains of a nine-man break that had formed early in the day. The 23-year-old Agritubel rider attacked around five kilometres from the summit and rode home strongly to give the French their second stage win of the race, following Thomas Voeckler’s victory in Perpignan. AG2R’s Rinaldo Nocentini, another member of that breakaway, took the yellow jersey, but his lead over Alberto Contador is just six seconds. The Spaniard set out to prove who the leader of the Astana team was by attacking hard inside the final three kilometres. His acceleration showed he meant business and the reaction behind was slow. Contador finished ninth on the stage, 3-26 behind Feillu, but 21 seconds ahead of his team-mate Lance Armstrong. That means he has turned a 19-second overall deficit into a slender two-second lead as the pendulum of power swings one way then the other at Astana. Britain’s Bradley Wiggins (Garmin) rode very strongly on the climb and came home between the Schleck brothers, Andy and Frank, in the group with the other favourites to move up to fifth place overall. The 224-kilometre stage from Barcelona was a slow-burner. The early kilometres were active, with plenty of attacks, but it wasn’t until the 34-kilometre mark that something stuck. The nine men who got clear were Egoi Martinez (Euskaltel), Christophe Riblon and Rinaldo Nocentini (AG2R), Jose Ivan Gutierrez (Caisse d’Epargne), Aleksandr Kuschynski (Liquigas), Christophe Kern (Cofidis), Brice Feillu (Agritubel), Jerome Pineau (Quick Step) and Johannes Frohlinger (Milram). At one point their lead was in excess of 13 minutes and even as they approached the final climb they had an 11-minute advantage. Astana led the bunch onto the lower slopes of Arcalis, but it wasn’t until the final six kilometres that things began to happen. Kuschynski was first to be dropped from the front group as the climbing started in earnest. After a couple of tentative accelerations, the first serious attack came with 6.4km to go. Kern’s attack saw Pineau (Quick Step) dropped and Gutierrez in trouble. Then Riblon attacked, hoping to thin it down some more, only for Feillu to capitalise. With his blue Agritubel jersey zipped to the waist, he got a little gap and pressed on in impressive style. Behind, Astana rode on, doing a very passable impression of US Postal Service or Discovery Channel. 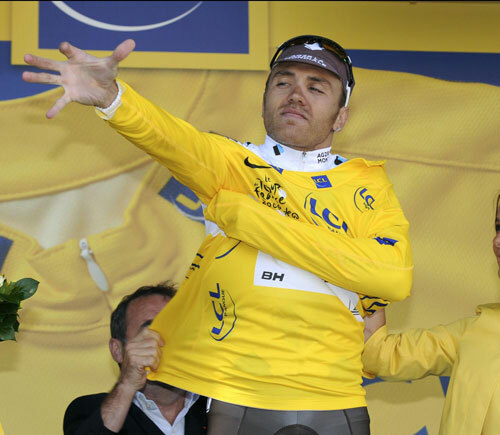 There is nothing subtle about Johan Bruyneel’s tactics. Cancellara fought hard, but lost contact as the gradient steepened a little, his spell in the yellow jersey over. Feillu, demonstrating that he’s the climber in the family, while his older brother Romain is the sprinter, looked good for the victory as the riders behind failed to close the gap to him. He held off the chase of fellow French rider Christophe Kern, who was second. As well as the stage win, Feillu also took the polka-dot jersey as leader of the king of the mountains competition. But without being disrespectful to the young French rider, the important action was about to happen further down the mountain. They left it late though and it was Cadel Evans (Silence-Lotto) who attacked first, with around three kilometres left. Perhaps he was incensed to see Yaroslav Popovych setting such a pace on the front for Astana – after all, the Ukrainian didn’t ride like that for Evans at Silence-Lotto last year. Contador and Armstrong reacted and flooded round the Australian as if to tell him to know his place. Then Evans’s team-mate Jurgen Van den Broeck attacked. That was nothing compared to Contador’s move, which was hard and persistent. Andy Schleck (Saxo Bank) tried to respond, but couldn’t. Contador crossed the line just six seconds shy of gaining the yellow jersey. He won’t mind that, but as he allowed himself a smile on the way to the line, he will reflect that he has a pace on the climbs that no one, not even Armstrong, can match. Rinaldo Nocentini pulls on the leader’s jersey. How’s it going to look with brown shorts?